This project is situated on a plot once occupied by Exchange Station that closed in 1969. 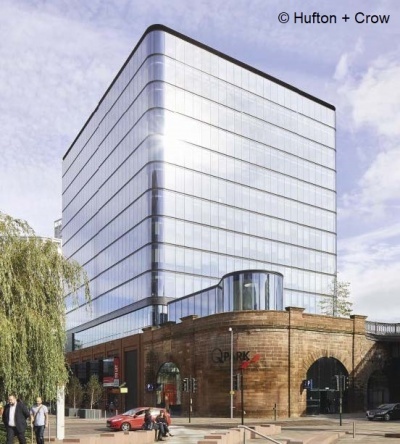 The Grade II listed sandstone façade viaduct that once supported the station has been retained to form a grand base for a new office building, which sits at plinth level 9m above a significant new area of public realm. Further details of the design and construction of this project are available here. This steel and glass 11-storey office building contains a substantial high‐spec multi‐storey car park, together with retail and workspace units, tied together with an innovative ‘hub’ circulation building. This is a complex structure, but the judges were impressed with the overall economy of the building, taking into account the need to incorporate existing façades together with the complexities of the transition between the car park and office levels.